The Lanius Room features a unique curved wall, and the beautiful, inlaid floors include a design that curves right along with it. The room also features a Baroque-style, built-in Pier mirror. The room is named for Henry Smyser’s mother, Ms. Lanius, which was also Henry’s middle name. 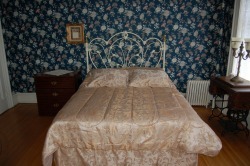 This room, with its floral wallpaper, antique sewing machine, and stylish antique bed is a tribute to mothers everywhere.